I recently created a new Travel Tool Set that I can EASILY take to demos, club meetings and symposiums. I have been using it full time in my studio recently to test it out. I am real happy with it. See photo below. The heart of the system is a new 5/8″ Quick Release Tool Handle from Jimmy Clewes. It works really good. I saw Jimmy use it on the 2018 Norway Woodturning Cruise. I was real impressed with the Quick Release mechanism that Jimmy has come up with. Just a simple 1/4 turn of the handle with your hand (no tools) locks a tool in place or releases it. You can change tools real fast. So, swapping tools does not interfere with the flow of a demo. 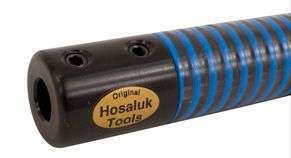 Set Screw tool handles like the Hosaluk, Oneway, Bosch, Jordan, etc handles have been around for a long time. Loosening the set screws, taking out a tool, inserting a different tool, and then tightening the set screws takes too long in a demo situation. It also takes to long for most people at home. Thus these handles are best for the semi permanent mounting of tools. Recently collet tool handles have come on the market. Like the Robust, Serious, Kelton, Carter, etc collet tool handles. These handles use standard off the shelf metal working collets that have been around for a long time. The ER32, ER16, etc collets are used to mount round rods in metal lathes. The collets are designed not to slip in tough metal lathe turning situations. Thus, they are not ideal for a tool handle. They weight to much and they are not cheap. When you add a steel nut and mounting, plus the collet the handles get to heavy overall and they are not balanced. They are way to heavy on one end. Jimmy’s Quick Release Tool Handle is sort of like a collet handle. It uses an eccentric (offset) collar to QUICKLY lock a tool in place with just a simple 1/4 turn of the collar. You need to get the amount of offset JUST RIGHT to make one of these work and Jimmy has done it! The Quick Release Units are aluminum and weight very little. I REALLY like them! Jimmy sells 16″ or 22″ long Ash wood handles that come with an aluminum Quick Release Unit or just the Quick Release Unit. 5/8″ Quick Release Units are $60, 16″ handles are $85, 22″ handles are $95 on 11/2018. You can only purchase these directly from www.jimmyclews.com or www.woodturningtoolstore.com. Jimmy also sells 3/8″ and 1/2″ units. I thought about purchasing just the quick release mechanism from Jimmy and then making my own handle. I quickly realized this was a stupid idea. STRAIGHT grain hardwood blanks are not cheap. Jimmy’s only charges $25 MORE for a nice ash handle with a quick release. Jimmy’s handle shape is very close to my preferred wooden tool handle shape. Thus I just purchased a 16″ handle from Jimmy for $85 and customized it with my own rain bow colors. Note: I DO NOT get any kick backs or anything like that from Jimmy or The Woodturning Tool Store. I paid full price for my stuff from Jimmy. Jimmy also sells Set Screw Units that look very similar to his Quick Release Units. I like the looks of the Set Screw Unints. However, I like the Quick Release Units better. 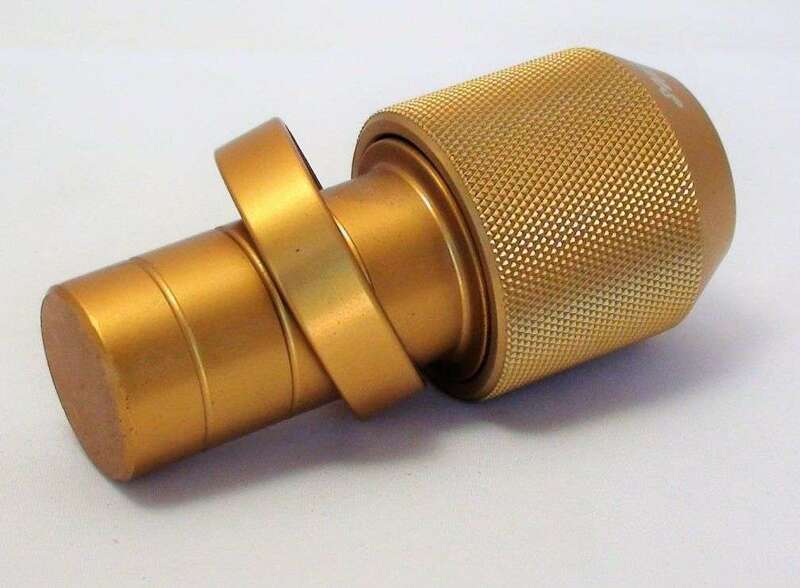 Tools with a 5/8″ or 16mm shaft fit no problem in Jimmy’s 5/8″ Quick Release Unit! For smaller tools, Jimmy’s sells bushings with set screws that convert 3/8″ or 1/2″ shaft tools to 5/8″. So you can mount them in 5/8″ Quick Release Unit. However, the bushings are not cheap. $27 each on 11/2018. 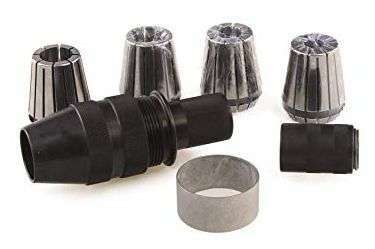 If you don’t want to waste a lot of time swapping bushings with set screws then you need one bushing for each 3/8″ or 1/2″ tool. I needed 6 bushings. This was going to get expensive real fast. Jimmy’s bushings are only 2-3/8″ long. The bottom of Jimmy’s Quick Release Units is solid. Thus, any tool you stick in there never goes in there more than 2-1/2″. This is not a problem. When tools come with a wooden handle the tool only goes in about 3″ or less. I decided I don’t need any silly set screws for $27. I super glue or epoxy my tools into wooden handles. This works just fine. If I don’t need a set screw then I can make my own bushings no problem. I just need to glue my tools into some short chunks of steel tubing with a 5/8″ outside diameter (OD). 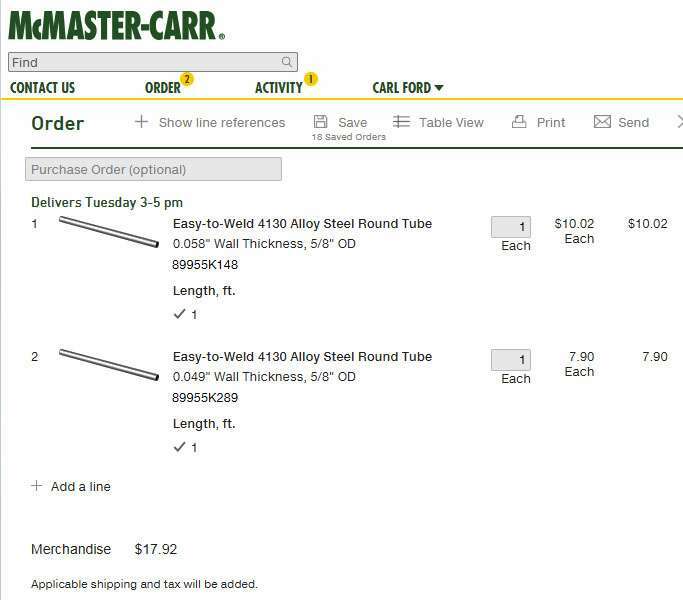 I purchased some 5/8″ outside diameter, 0.509″ inside diameter steel tubing from www.mcmaster.com. 3 feet for $24 + shipping on 11/2018. I then sliced off 2-1/2″ lengths with a hack saw. Each of these cost less than $3. I press fit and super glued my 1/2″ tools into my bushings. In the photo on the right Jimmy’s 1/2″ bushing is on the left. My chunk of 2-1/2″ long tubing is on the right. However, I ran into a small problem here. A 1/2″ is really 12.7mm. Most tools are NOT made in the US. They are made in Canada, Europe, etc to mm standards. 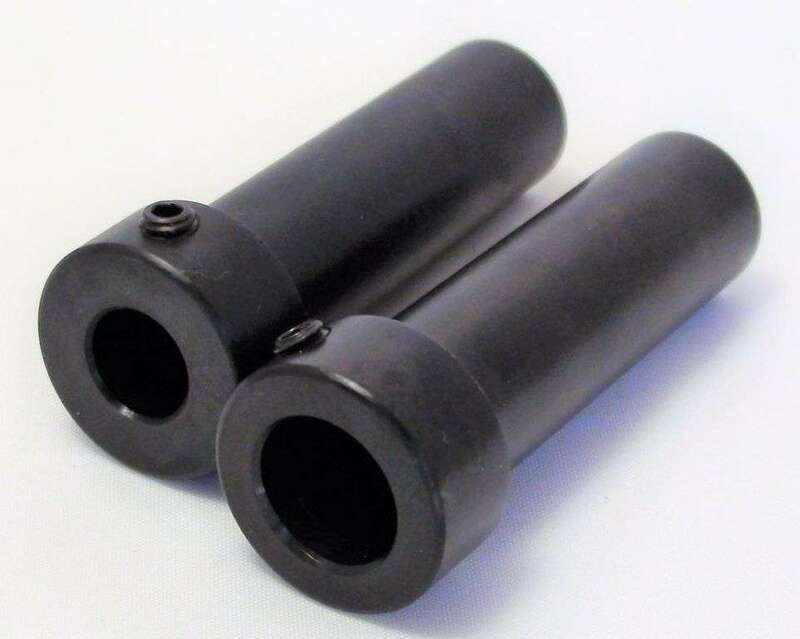 They are advertised as 1/2″ or 12mm. But they vary all over the place and they are frequently over sized. 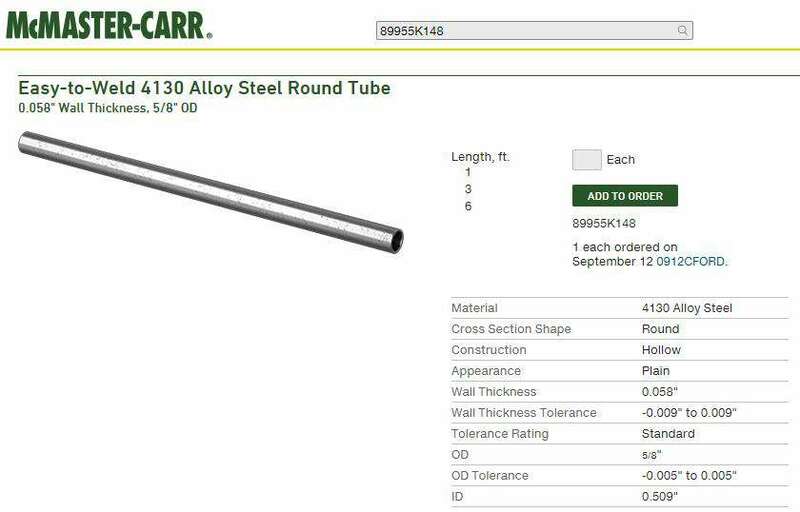 If they are over 12.8 mm they will not fit in a 0.509″ ID steel tube. I had to grind down some of my tools to fit in the 0.509″ ID steel tubing. This was far from easy! I have one of Jimmy’s 1/2 bushing. Some of my tools would not fit in Jimmy’s 1/2″ Bushing. Note: Think about it. 1 mm is almost to small for me to see. .8 mm in something like 12.8 mm is really small! Thus, if I had to do it again I would hedge my bets. I would purchase 1 ft of 5/8″ OD, 0.509″ (12.93 mm) ID steel tube, www.mcmaster.com # 89955K148 $10 and 1 ft of 5/8″ OD, 0.527″ (13.39 mm) ID steel tube, www.mcmaster.com # 89955K289 $8. All prices on 9/11. This would cost less for the tubing and a lot less for shipping. I don’t have any 3/8″ tools. If, I did then I would also purchase some tubing from www.mcmaster with a 3/8″ ID. Something like # 89955K829. Note: 16mm is very close to 5/8″. Thus, you probably will not run into a lot of problems with 5/8″ tools. 5/8″ is 15.88 mm. I did not run into any problems with my 5/8″ tools fitting in Jimmy’s 5/8″ Quick Release Unit. My experience seems to suggest that McMaster shipping is sort of flat rate. Anything that fits in a 6″ x 12″ x 18″ box ships from their Robbinsville, NJ warehouse to my studio in Poughkeepsie NY for around $10. Weight is a don’t care or a very small multiplier. If I fill the box up with lots of steel it may cost $12 or so. This is my OBSERVATION. Not a McMaster policy, etc. Your mileage may vary! Shipping anything that comes in a 36″ tube adds another $12 to the shipping cost. This amount varies more. My 1/8″ P&N Parting Tool and my Al Stirt style Shear Scrappers have rectangular tangs rather than round shafts. I mounted these in the above 5/8″ OD bushings, the same way I would mount them in a wooden handle with a round hole. I cut 3″ long shims from a 1/2″ OD wooden towel. The shims plus tang fit nicely in a 1/2″ round hole. I first insert the tang in the hole. Then I drive the shims in. Cut off any extra shim that sticks out. Then I drip in some super glue. The SECRET here is to cut the shims lengthwise out of a LONG dowel BEFORE you cross cut them off the end of the dowel. The tools in my traveling set are the same tools I recommend in my “My Modern Tool Set” handout. Left to right in the photo. 1. 88 Degree Spear Point, 2. Left Hand Shear Scraper, 3. Right Hand Shear Scraper, 4. 1/8″ Parting Tool, 5. 1/2″ Hosaluk Double Bevel Detail Gouge, 6. 5/8″ Ellsworth Bowl Gouge, 7. 5/8″ Jordan Bowl Gouge, 8. 1/2 Stirt Bowl Gouge. Note: To cut weight and cost, I decided to live with out a Spindle Roughing Gouge. I will just use my 5/8″ Jordan Bowl Gouge if I need to rough down spindles. Jimmy had a nice leather tool roll (custom made?) on the Woodturning Cruise. After looking around a bit I decided to order a “Dickies Work Gear 57007 Grey/Tan Small Wrench Roll” from Amazon. $10 on 11/2018. I cut off the stupid little straps and anything else I did not like. Then, I added a chunk of double sided velcro from local big box store to hold the roll closed. I also cut out some of the stitches between compartments to make bigger compartments. Now I am really happy with my new tool roll. I am also really happy that I made by own 1/2″ to 5/8″ bushings rather than purchasing Jimmy’s bushings. Jimmy’s are nice but they have a flange that makes a place to put a set screw. The flange would stick up and take up to much space in my tool roll. Jimmy Clewes gave a demo and workshop at NWA last fall and I bought the handle and some of his inserts. I find the D way is a perfect fit and so I use that most often. It as so nice to not have knurled knob in the way of the turning. And it is so much faster, not that I am in a hurry. I am sure it is a nice collett or Jimmy would not sell it. I would hate to have to demo or be in an all day workshop with only a 16″ handle, way too long for a skew or spindle gouge for me. Always look forward to your blogs that are packed with useful information. I don’t like having to tighten and loosen setscrews, but I do like being able to vary how deep each tool can project from the handle. I wonder if a future iteration of the 1/4 turn collet will have that ability. Thanks. Joe, You can just cut the end off the bottom if you want to go deeper. It may not hold as well. How often do you change the depth of tools you have mounted in wooden handles?